Today we discuss the the carnivorous mercenaries from Pech, and every Fire Warrior’s best friend – Kroot Carnivores. 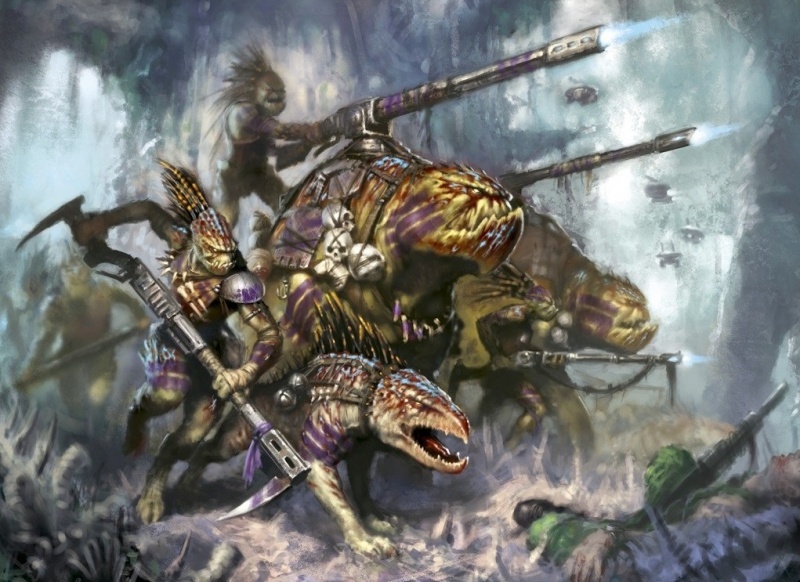 Though their savage ways are viewed with distain by the T’au, that doesn’t stop Kroot Carnivores from being the most common T’au auxiliary force. Their ability to stealthily hunt their prey, only to viciously stab and hack at it with their crude knives (followed by ritualistic consumption of their fallen enemy’s flesh) has turned out to be pretty handy against the countless horrors of the 41st millennium. 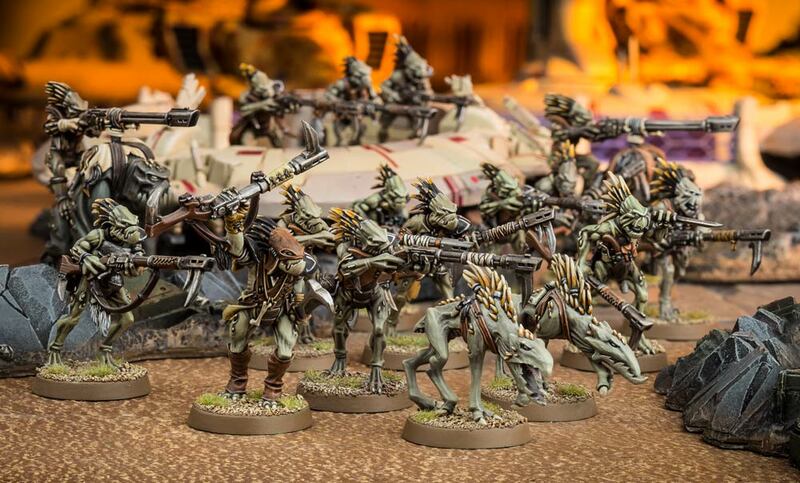 On the tabletop, Kroot Carnivores consist of at least 10 Kroot models armed with rapid firing weapons that double as close combat weapons. Up to 20 Kroot models may be included in a given unit. 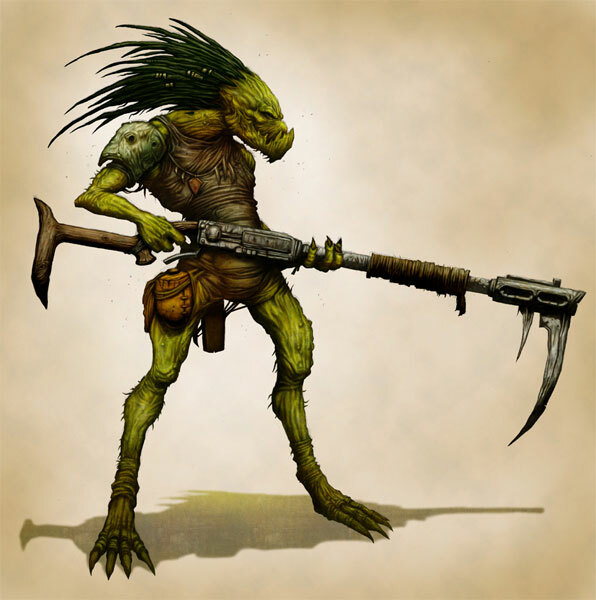 Each Kroot Carnivore is armed with a Kroot rifle (shooting: 24″ Rapid Fire 1 S4 AP0 D1, melee: S+1, AP0, D1). After deployment but before the first battle round, this unit may move up to 7″. Kroot Carnivores are a somewhat decent screening and “speed bump” unit. With their 7″ pregame movement and then 7″ regular movement you will find yourself within rapid fire range and within range of a long charge first turn, assuming standard 24″ separated deployment zones. With the first turn, a full unit of 20 Carnivores will put out 40 shots from 10″ away, which is not insignificant, even with their BS4+. Every now and then, you might get lucky with rerolls and make that long charge to try and tie up some units or touch some tanks. They could even be used to try and hold mid-field objectives turn one, since their movement will give them easy access to them. I say “try” because Carnivores die to a stiff breeze. With their Sv6+, even in cover they’re only getting a 1/3 chance to save against an AP0 attack, which is pretty bad. You’re probably going to want to take larger units of them to overcome this drawback, but then you’d be falling victim to their Ld6. With any significant number of them being killed in a turn, you’re all but ensuring that you will lose several more to Morale tests. One way around their lack of resiliency and “sticking” power is to buff them with an Ethereal, thanks to the Carnivores having the <T’au Empire> faction keyword. You’ll probably want the Ethereal to be on a hover drone in order to help keep up. The Ethereal won’t get the pre-game 7″ movement so make sure you leave at least one Kroot straggler within 6″ of the Ethereal to benefit from his leadership buff (Ld9, or Ld10 if he’s Sa’cea) and Sense of Stone invocation (6+++ FnP). They will be far less susceptible to Morale losses this way, but any sort of dedicated firepower will be able to take them out relatively easily. Though they do have WS3+, they no longer have any sort of Sniper Rounds like they had in previous editions and don’t get any sort of extra bonus to cover saves for being in wooded areas. Even with a Kroot Shaper (a Kroot <Character> who gives all <Kroot> rerolls 1 To-Wound) it’s nowhere near enough to make Kroot competitive. They’re not enough of a threat to have to deal with in most situations (thanks to their singular attack) and the worst they can really do is try and assault a Leman Russ so it has to fall back and can’t shoot the next turn. That’s not nothing, but there are other units who can do that as well or better. As a result, there’s really not a lot of flavor to them and not many things they uniquely bring to competitive T’au lists. All in all, if we look at the things they do somewhat decently (cause disruption in the middle of the board early game as well as hold mid-field objectives) we can see that Stealth Teams do it better. Stealth Teams have better toughness, -1 To-Hit always, two wounds a piece, more movement, more flexible deployment, better save, and better leadership. If you’re wanting a unit to get in your opponent’s face and throw a wrench in their plans, that’s your unit, not Carnivores. The obvious is to kill them and kill them easily. Don’t get caught off guard if you have any specially deployed units like Scouts and be first turn-charged using hostage tactics by a unit of Kroot. Overall, I love Kroot. I love the fluff, the model conversions of things like a Carnivore driving a Piranha, and seeing a table full of 60+ green Kroot bodies. I like Kroot in narrative and fun, friendly games. They just don’t have the resiliency or toolkit to stand up to any sort of actual competition. This makes me really sad because for some reason I really like the idea of Kroot. Maybe it’s the ferocious looking models, maybe its the hope of playing in phases other than the Shooting phases that they give me, maybe I just like the color green. By and large, Kroot (specifically Carnivores but the other variants do too) feel like someone was rushed with their rules. They have average to below-average stats with little or no special rules to not only make up for that fact, but to let them stand out at all. They’re basically green pathfinders who wish they were stealth suits. I’ve heard a few rumbling of a Krootdex (Kroot Codex) in the works, which I would personally love and buy in a heartbeat, but I have no idea how realistic that is. They certainly need something to give them flavor, more synergy (they totally miss out on sept traits and can only gain For the Greater Good when you take the Daly’th-specific WL trait), and better rules. As it stands, they’re just cool in my mind, not on the tabletop. ~What would you do to make Kroot more competitive?